In recent years Costa Rica gained a reputation as one of the most attractive tourist destinations on the west of the Atlantic Ocean. Beautiful beaches, lush nature and socioeconomic stability make this country a dream place for vacation especially during the cold winter months. The Costa Rica’s beaches are wild, clean, untouched and almost deserted. They are different from anything you’ve ever seen or will see. They are different from those in the rest of the world and even from the beaches in the Caribbean region. Some of them are white, others are golden, and third – beige. There are even almost black beaches or cinnamon colored. All of them, however, create in person indescribable feeling when he stands on the shore. Holidays on the Costa Rica’s great beaches is a pleasure of the senses – a combination of colors, sounds, aromas and fabulous atmosphere. An important feature of the public beaches in Costa Rica is that they are not patrolled! In the northwestern-most parts of Costa Rica, on the Pacific coast is located a large bay, called Golfo de Papagayo. In its inner part there is a small bay called Bahia Culebra. 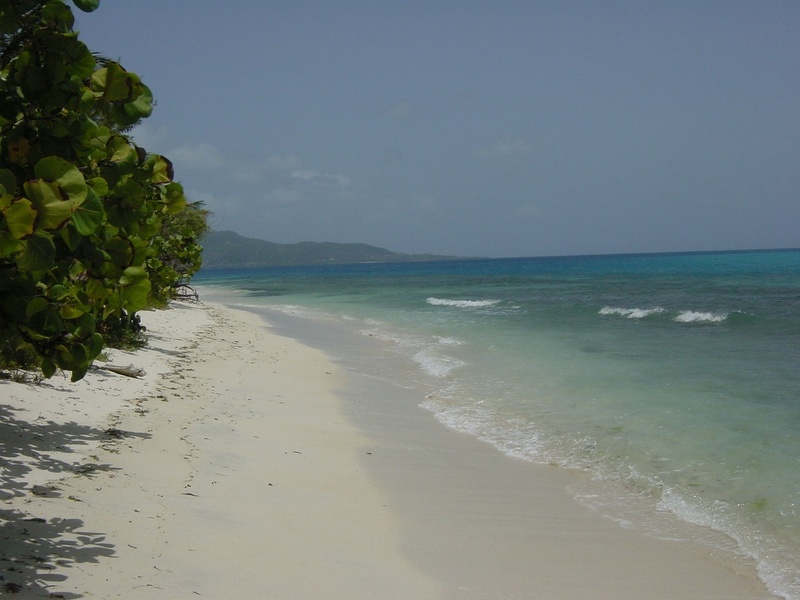 A characteristic feature of Bahia Culebra is that the water is almost always calm. Here you will find several small, but beautiful beaches with beige sand and transparent water. The bay is surrounded by rare subequatorial forests. Here many plants lose their leaves during the dry season. In close proximity to Bahia Culebra is located Playa Hermosa. The beach is about 1.3 kilometers long and is situated between two hilly peninsulas. The sand is beige with a touch of ash. 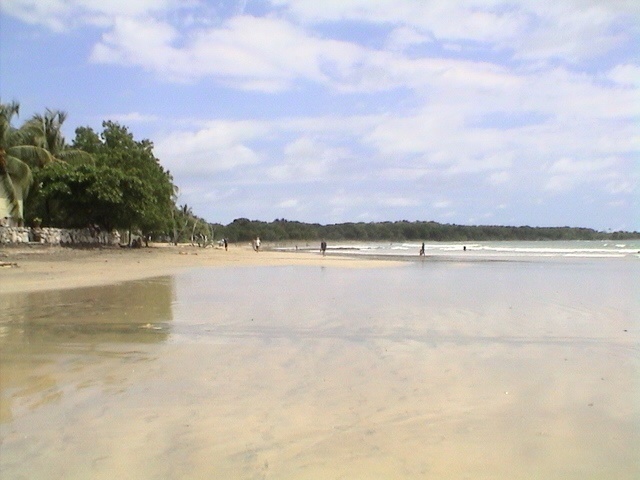 Bahia Hermosa is among the Costa Rica’s busiest beaches. The reason is that it is located in quite developed tourist area with many villas and small hotels. Playa del Coco is located in close proximity to Playa Hermosa in northwestern Costa Rica. The sand is dark beige with cinnamon shades. Like every other place along the coast of Costa Rica, and Playa del Coco is clean and looks pretty wild, although it is located in a busy tourist area. Besides the great number of hotels and villas where tourists could stay, the place is attractive center of the real estate sector. It is no secret that the shores of the Pacific has always been a desirable place to live and Playa del Coco is no exception. Cinnamon colored sand, waves which seem to create endless strips of sea foam and forests of coconut palms, reaching to the sand itself attract lovers of tranquillity and pure nature from all around the world. The beach is located on the Pacific coast and in the vicinity there is not major cities. The truth is that Playa Matapalo sometimes seems so lonely place as you’re the first person to set foot on this beach ever. Playa la Penka is a beautiful beach whose fine beige sand with light golden nuances looks very attractive against the background of the smiling sun. Located in the northwestern part of Costa Rica, the beach and its beautiful surroundings are an excellent place to rest. However, there is a chance to find yourself completely alone in there – just you and the endless blue sea. Playa Santa Teresa is located in the southwestern part of the peninsula Nicoya. It is a long, wide beach with fine white or beige sand which in places has a golden hues. Sometimes the ocean is calm as a mirror, but otherwise the waves are huge – all depends on the weather. In case of bigger waves, the place becomes a meeting point for lovers of surfing. It is located near the village of Malpays and dense rain forest reaches to the beach itself. 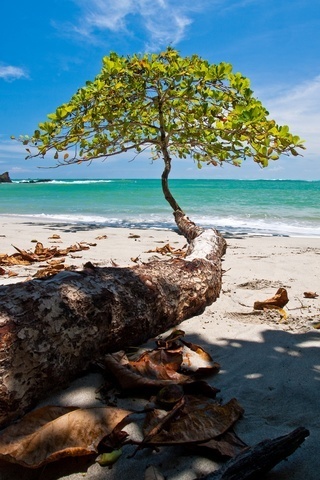 Playa Negra is a beautiful beach, which can be found in north-west of Costa Rica. Located on the Pacific coast, Playa Negra is a place whose name quite mislead. The sands are not dark, but just on the contrary – very bright with golden hues. The location is excellent for fans of surfing, because there sometimes are formed huge waves. In the region grows subequatorial lush vegetation, which, however, strongly inferior to the rainy jungles on the Caribbean coast. Playa Blanca, also known as Playa Flamingo is located in north-western Costa Rica. The area enjoys the most beautiful beaches in the country. The place just will leave you speechless. The border between white sands and crystal clear waters is almost unnoticeable. Here the sea is often calm and because of this reason is very attractive on the background of the year round high temperatures in Costa Rica. Similar to most places in this part of the country, near the beach grows thick subequatorial vegetation, which becomes green during the rainy season, turning into a real jungle. Tortuguero beach is one of the longest and most beautiful beaches in Costa Rica. It is located in the north-eastern part of the country, on the Caribbean coast. Here the humid equatorial jungle of Tortuguero National Park meets the wild and glamorous Caribbean beaches. The sand varies from light beige to cinnamon colored. This beach is among the most important natural places in Costa Rica, because here sea turtles come ashore to lay their eggs. Located on the south-eastern Caribbean coast of Costa Rica, Punta Uva is considered to be the most beautiful beach in the borders of this exotic tropical country. In the vicinity of the covered with tropical rainforest peninsula, you will find incredibly beautiful wild beaches with golden sand. This is also one of the top places in Costa Rica in terms of opportunities for snorkeling among the stunning Caribbean coral reefs. This beach is located in the south-eastern part of Costa Rica, close to the border with Panama. It is situated on the shore of the Caribbean Sea and has a dark color that remind of ash. The area is almost deserted, except for a few small villages. The outskirts of Playa Gandoca are covered with dense equatorial jungle. Manzanillo beach is located on the Caribbean Sea, north of Playa Gandoca. It has much more typical Caribbean vision. The sand is light beige with soft golden hues with overhanging coconut palms. Amazing tropical rainforest reaches the beach. Similar to the other Costa Rica’s beaches, this one is also wild and unpatrolled. Thrown of the strong tropical storms branches usually remain on the sand until the sea swallows them again during the next storm. Bahia Junquillal is small and very beautiful bay along the Pacific Ocean. It is located in the north-western part of the country, about ten kilometers from the border with Nicaragua. The bay is very attractive with its bright beige sandy beaches. Surrounding area is an excellent camp site location for the lovers of beautiful nature. The bay is surrounded by subequatorial forests. Many trees lose their leaves during the dry season, making this place unrecognizable in different parts of the year. 14. Playa Conchal – Guanacaste Province. Located in the north-western part of the peninsula of Nicoya, Playa Conchal is one of the most beautiful beaches that one can find on the Pacific coast of mainland North America. The sand is white with ivory nuances and sea waters are clean and transparent. Around the beach grows lush subequatorial vegetation which loses its leaves during the dry season. According to the authorities in the country, this place is among the cleanest coastal areas in Costa Rica. Playa Carrillo is considered to be one of the best places in Costa Rica to spend a perfect vacation. This piece of paradise is located in the western peninsula Nicoya, on the Pacific coast, in north-western Costa Rica. The abundance of sunlight in combination with perfect temperatures are an excellent addition to the breathtaking white sandy beach. The waters are very calm and offer excellent conditions for swimming. 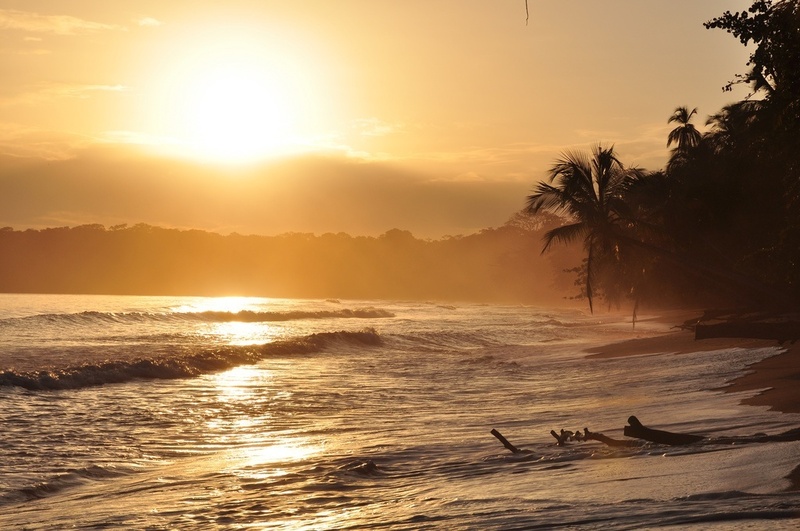 And that’s not all – according to the authorities in Costa Rica, Playa Carrillo is one of the cleanest beaches in the country (and therefore the world)!